People always ask me which lessons our traders have given me that have made the most impact on my trading. Of course, setups are important. But even more importantly, it’s been the lesson that I must focus on a few setups that fit my trading style, risk tolerance and account goals, that also match the current market environment. You don’t need to know everything there is to know about the markets in order to make money. You may have heard the famous figure of speech that states, “The jack of all trades is the master of none.” So, where we focusing, you ask? 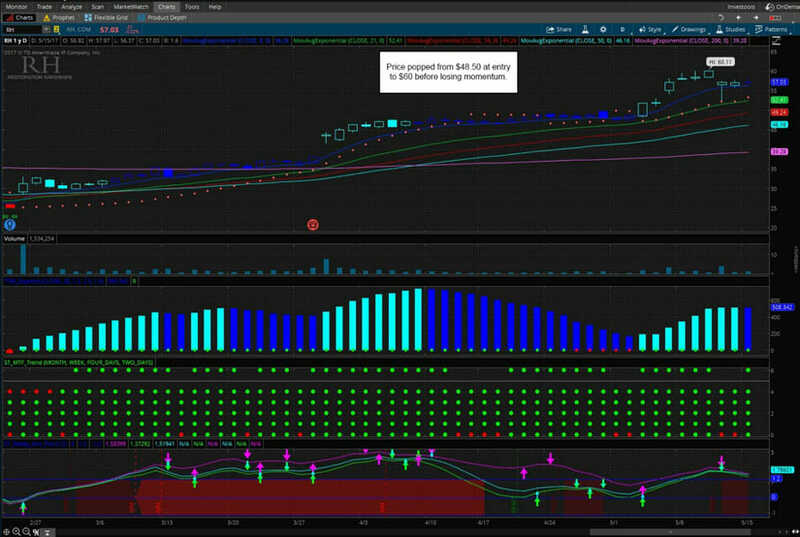 Right now, our traders have been focusing on earnings and high short interest stocks that are ready to pop. With the market chopping around and trading at extensions, our traders have been focused on big moves in single securities – one of their favorites is high short interest stocks. What does that mean? It means that there is an unusually high number of traders shorting the stock – and they when it becomes evident that they are wrong due to rising price, they start to panic. As price climbs further, their stops get taken out, which only further accelerates the buying of the stock. As they are forced to buy back their shorts (or cover), it causes a pop in price – known as the ‘Short Squeeze’. There are a lot of high short interest stocks, but which are the best to buy? You must pick ones in which the shorts are forced to sell. Having high quality setups in your arsenal is imperative, and knowing how to play them properly is clearly critical to success, but you also must play them at the right time. Buying high short interest stocks is an art, especially knowing when to focus on them, and then which stocks are better than others. You want to buy stocks that have high short interest, that are in an uptrend when the market is also in an uptrend, where you can see that shorts are finally giving up. What is the most important part? The market must be in an overall uptrend. That time is right now, so we have ideal conditions for high short interest candidates. Let’s look at a few recent examples that we’ve done in our trading room, and analyze the how’s the why’s behind it, to utilize it properly next time it comes around. 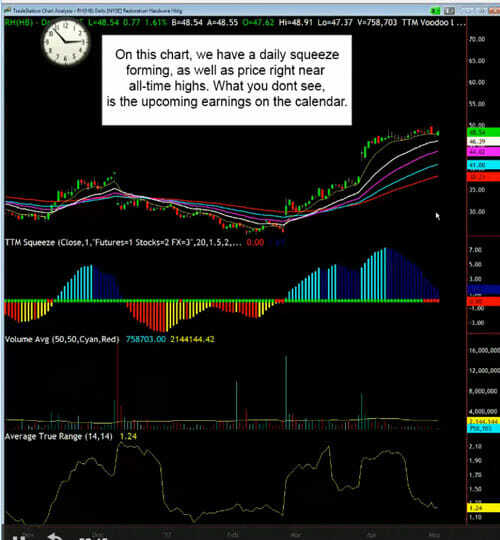 Within a few days, the stock price saw the ‘pop’ we were looking for, and RH traded $10 higher, where we closed out half of our options at a double for $6.50, and the remaining half at $9.70 – triple on our money. What else was required to make money on this trade? Patience. How many new traders probably took profits once they were making money? John and HG know how these plays act, and that allowed them to hold on until they tripled their options. Do you need more patience in your life? Listen to HG in the mornings. He is our Zen master and master of patience. I promise, it will wear off on you! There will always be speculation about how long this rally will last – but does it matter? We can focus on the setups that we know work in the current market conditions, and use those to make money. Of course, nothing works 100% of the time, but mastering high probability trades within the right environment will give you your best shot. And right now, that means utilizing and mastering the short squeeze. RH, PLCE and VEEV have all been excellent to us lately. By learning how our traders identify and play these setups, you can learn how to play them yourself. Come join us in our trading room (if you haven’t already),and be on the lookout for the next short squeeze setup with us so you can learn the nuances of the trade – they aren’t all created equal! If you missed these plays, don’t worry – the key is learning how to identify this pattern the next time it comes around, so you can take apart in the action.